Day time is quietly convenient for mountain bikers, but in northern hemisphere day, times are gradually dwindling. Darkness can never stop a bike enthusiast from riding their bike. Night time mountain biking is indeed a blast. Because the trails and forests are calm and quiet, your vision stays focused on the road. Still, you may face a different kind of obstacle such as colliding with wood, rock, bike, cars, and so on. There is a way to ride in the dark while staying safe, by using an MTB light. Best MTB lights will help you stay focused on the road. Since, MTB light is an outcome of electronic technology, which means they are getting better with the time. We’ll help you on your search of the best MTB lights for your particular needs. Read on to know more. Night riding can be enjoyable and adventurous with the addition of a good pair of lights. MTB lights have advanced considerably throughout the years. The technology added some additional features to make it more effective. The light is now brighter with the latest lenses, last for hours, have a faster recharge time, and internal technology is updated. You may get confused to understand all the details that’s why we are presenting a list of ten best MTB lights. We’ll discuss them in details also a lot of things that you should consider. You will find what makes our listed product best among all. Without wasting your precise time let’s start with the review. Bright Eyes 1200 lumen is one of the most gorgeous and powerful bike light available today. They work consistently for long that’s why this one is on our top selection. It goes through seven different extreme tests which you can rely on. This newly upgraded bike light with Lumen CREE T6 LED technology offers the brightest light. The waterproof body along with a waterproof battery will protect the light in extreme weather. This versatile light fits any models of bike handlebars. A silicone taillight shows the backside view and also helps others to identify you. The external rechargeable battery lasts for 5+ hours on high, 10+ hours on medium, 26+ hours on low light condition. Besides, it includes a headlamp harness, charger, O-ring, extension, and instruction and diffuser manual. It also comes with a Velcro strap to attach the light with the handlebars. 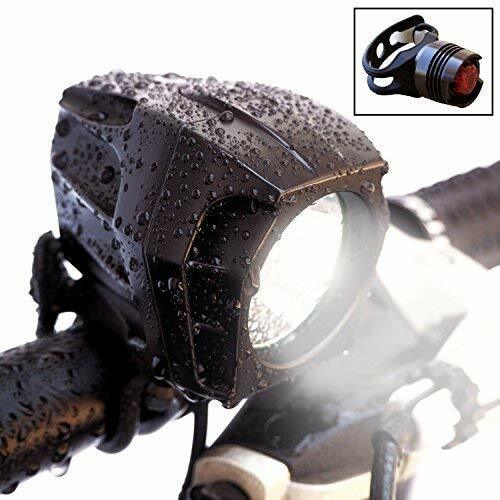 You can also use this rugged and dependable bike light in camping, hiking, and running. The overall unit is available at a reasonable price. Bright Eyes 1600 Lumen is the upgraded version of the previous one. This one comes with more powerful headlight with 1600 lumens that cover a wide area. The specialty of this light set is that there is no dimming during use. Similar to 1200 lumen light, it offers the Lumen CREE T6 technology. This extreme bright light also operates at three lighting condition. A waterproof battery lasts for 4+ hours on high with 1600 lumen, 6+ hours on medium with 900 lumens, and 16+ hours on low condition. With the moderate light, this one is the longest running light in the industry. You don’t have to worry about the darkness as it covers 500ft with pure brightness and 3000ft with high visibility. It can be attached to any handlebars through a Velcro strap. Additionally, it provides four heavy-duty rings for easy headlight mounting – also, a head harness, silicone taillight, diffuser lens, charger, and extension wire. This light can be used in camping, hiking, and running also. The price is also compatible with the features. No matter how much experience you have in the trail, Cycle Torch will assist you with their best. 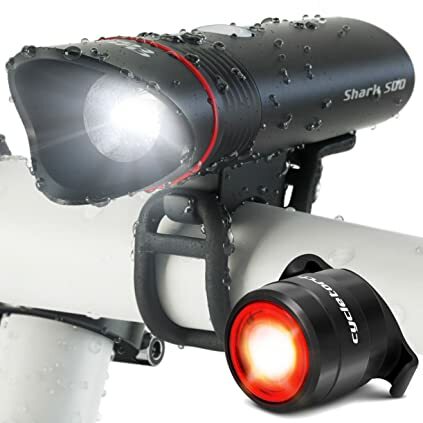 Cycle Torch Shark light will provide the safety in both day and night. The headlight with 500-Lumen CREE XML T6 LED is bright enough to make the road visible. It includes a most shining rear light to make you visible to the nearby peoples. The compact yet sturdy design is specially designed for urban environments. The light unit is so lightweight that you can easily carry them anywhere. The headlight has four lighting mode such as high, medium, low, and flashing mode. It has a 2400mAh battery that lasts for up to 30 hours in flashing mode. The taillight includes a 100mAh lithium-polymer rechargeable battery that lasts up to 15 hours in pulse mode. Also, the waterproof body protects the light in rainy and snowy weathers. Additionally, it includes a smart technology USB charger, rubber straps, and charging cable. The price is also reasonable so that you may give it a try. Be focused on the road and be seen with this classic CAT EYE headlight. Whether you are riding in dim light or complete darkness, it’ll provide the optimum brightness. This compact light maintains the perfect balance between simplicity and functionality. It provides the brightest light with 700 lumens that could be your ideal riding partner. It offers four lighting modes such as high, medium, low, and flashlight. The battery time depends on the lighting mode, so choose it wisely. Still, it can provide 50 hours of battery life with a low mode in a single charge. You can easily mount above or under handlebar using FlexTight bracket. A micro USB cable is included for charging the light. The OptiCube technology assures the maximum brightness and visibility. Apart from that, it includes a low light indicator to keep safe and alerted in low-light condition. This lightweight light can also be attached to head harness. You will get this within your budget. Whether you need a light to extend your riding time or to make your nighttime outing happening, Te-rich bike light is an excellent option for you. To extend your adventure time, go ahead with Te-rich and embrace the darkness. This waterproof headlight will make the road visible with 1200 lumens. The gracious beam provides consistent performance. It lights your way up to 300meters. The setup is straight-forward, so you don’t need any additional tools. Secure the light on your bike handlebar or tubes and take it along with you wherever you go. Though a battery pack is included it works with portable power bank, wall brick charger, and many more. Te-rich features four different light mode with strobe four pattern such as high, medium, low, and strobe. A highly visible taillight includes three settings like fast blink, slow blink, and stable. It performs up to 12+ hours with moderate light power. This multi-functional and neutral white LED light can also be used for outdoor activities. The light body is made of durable aircraft-grade aluminum which can withstand any situation. 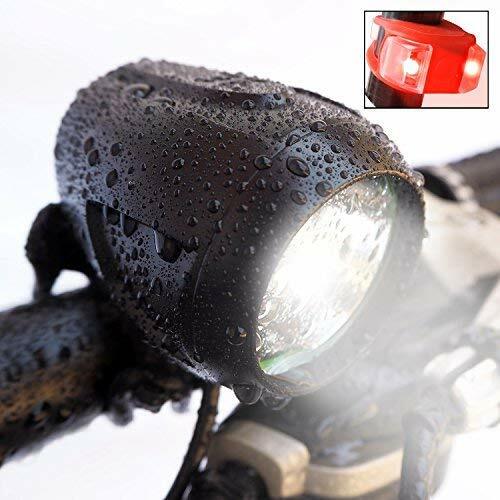 This solid bike light is available at a low price. The Cygolite Metro 500 is engineered with all the features that perfectly meets biker’s demands. You can have a great experience within your budget so that newbie rides can give it a try. The headlight features 500 lumen Cree X lamp LED composed with TIP optics. It includes a side illumination port that adds visual output. This headlight makes the illumination reach far on the road. 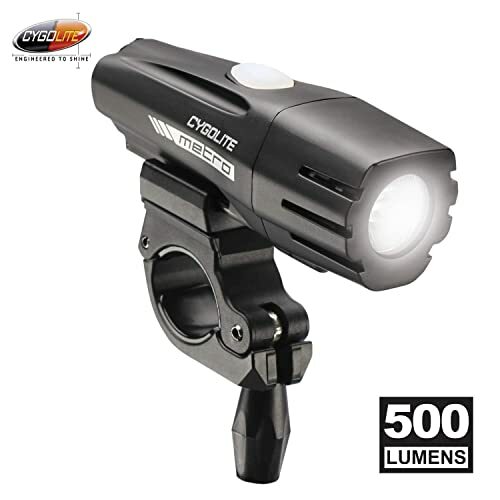 Cygolite bike light operates on six dominant light modes for ease of use. Besides the high, medium, and low mode; it can stand in low-lighting condition by running on flash mode. The Steady Pulse-mode alerts the motorist about your presence. Similar to Te-rich light, it includes a USB port for charging the light. The solid quick-release handlebar mount keeps it in place even in rough terrain. In a word, Cygolite features the solid construction with waterproof properties. It lasts for hours with a single charge. 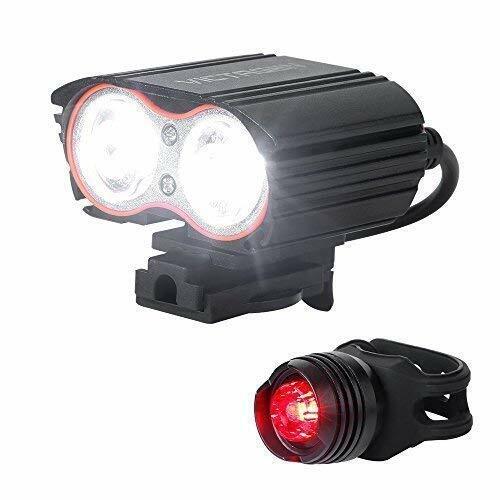 This best MTB bike light is available at a very reasonable price. 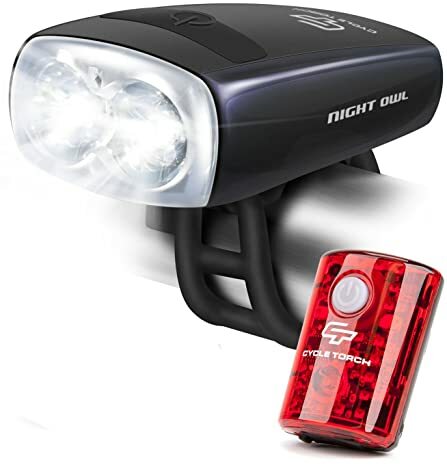 Save your money with Cycle Torch night owl rechargeable bike light. A great deal for the recreational bikers at a desirable price. This compact bike light features smart and modern technologies. You may know that 80% biking accident happens in daylight as people ignore the rocks or other obstacles. This bike light is not for only night time; also it’ll keep you safe at day time. 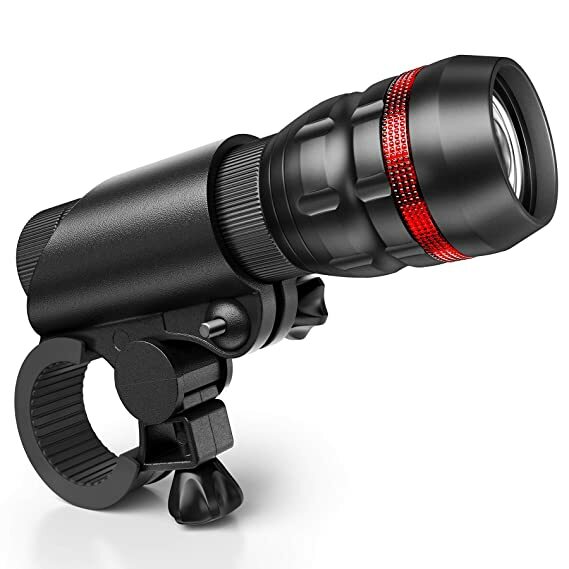 It features a precisely engineered lens with 200 lumens. Night Owl light has a universal fit which easily attaches with your bike. This compact and lightweight unit is easy to carry and maintain. This light performs consistently in any weather due to the waterproof and dustproof properties. A 2200mAh rechargeable battery lasts for 2+ hours on high light mode. 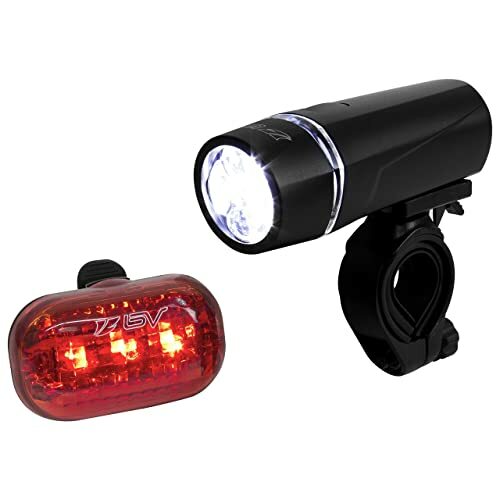 A taillight is included with the light set, and you can use the headlight as the flashlight. The overall light unit is available at an extremely lowest price. The thing becomes scarier when someone can’t locate you on the road. Victagen bike light will make sure this kind of things never happens again. This is the only product in our list with 2400 lumens in LED. The front light with high-quality XML-T6 LED assure maximum safety for a long time. It has four power status indicator that is visible in a power display. Victagen bike light comes with an external rechargeable battery. You can recharge the light using smart charging technology through a USB port. The rear light alerts your partner or nearest people about your presence. The battery lasts up to 4+ hours on high mode which is enough for a ride. Due to the flat beam shape, it can cover up to 700-900ft distance. The light unit is compatible with any bike model. Additionally, it features a waterproof body and battery that can withstand with any extreme weather. Also, it includes a 360o adjustable light stand with a quick-release bike mount. Similar to the previous one, the light unit comes at a meager price. Don’t let the night stop you, because Vont bike light offers a compatible alternative of daylight. 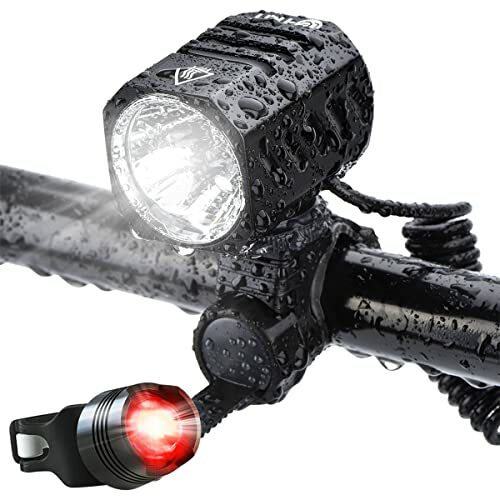 It wins the Amazon’s Choice Award for “Dual Bike Light” feature. Its advanced CREE LED light can brighten a wide area. 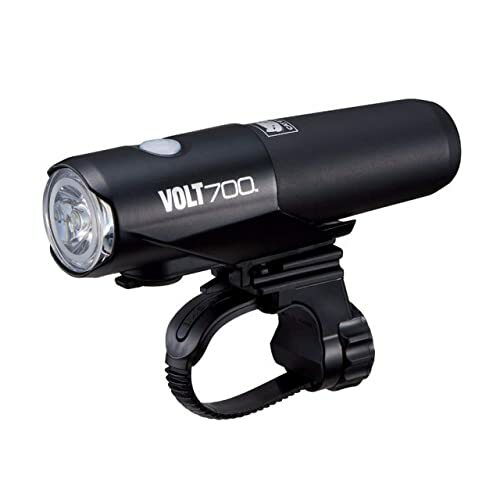 Due to its sturdy construction, vont bike light is perfect for rough riding. The light is easy to attach and detach in your bike handlebar. The streamlined yet lightweight design makes it easy to carry and store. You won’t feel any extra weight on your bike while riding. The waterproof body can withstand the extreme outdoor condition. The military-grade material makes the whole unit incredibly strong. Besides, it includes a free rear light to make you visible from every angle. Also, you can adjust the light focus with a rotatable ring. The 3 AAA battery lasts for almost 6 hours without any illuminations. Moreover, the price is also meager. So, what else we need from a bike light! Not bright as other but worth it. BV bicycle light provides all the advanced features for recreational, commuting, and touring cyclists. Probably this one is the lowest priced product in our list till now. It offers the maximum coverage of 1500ft with moderately bright light. This compact and sleek design includes a 5 LED headlight and a 3 LED taillight. Both of them are highly visible and can be operated with three modes. The headlight can be easily adjusted through a quick-release mount. The overall unit takes a few minutes for installation. The headlight battery compartments require 4 AA batteries where the taillight need 2 AA battery. You can also attach the taillight with your saddle bag to ensure your safety. The compact size of the taillight allows you to use it in hiking, running, and dog-walking. The headlight fits almost every handlebars and seat posts. These Polaroid batteries provide the consistent performance up to 80 hours. You may present multiple units to your nearest due to its lowest price. Mountain bikers find it more enjoyable to navigate the trails in the darkness. That is why they use lights to be safe and stay focused towards the road. We hope our listed product will provide perfect visibility as you ride during the night. They all are well-built, well-performing, and most popular best MTB lights option available in the market. While choosing one always keep in mind that safety comes first.